Yes you can work-out those eyes! Try these moves on your lookers the next time you need a break from the fatigue and overuse of your eyes. 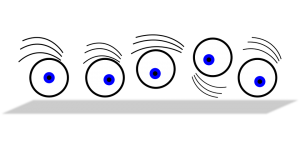 Look left to right – keep your head in place, facing straight ahead, and look with your eyes only all the way left and hold for three seconds. Repeat to the right. Look high and low- While in the same position, facing straight ahead, look with your eyes only all the way up and hold for three seconds. repeat the same looking down. Close the up tight- close your eyes tightly and hold for 10 seconds. Blink it out- to complete your intense eye workout session blink repeatedly.